It is part of the genius of Ignatius that he was able to recognise a pattern in the stages experienced by one who sincerely enters into the experience of the Spiritual Exercises with generosity and openness. With the lived experience of the First Week, the retreatant has come to a renewed personal awareness of the love and forgiveness of an infinitely compassionate and merciful God. The new freedom which results from this period of purification is usually felt as a graced determination to order one’s life accordingly and enter into one’s Christian discipleship with renewed enthusiasm and seriousness. You will notice that the exercises of the second week are generally of two types: a series of contemplations on the life of Christ, interspersed with four key meditations. All have as their ultimate goal growing in deep friendship with Jesus and conforming our lives to that of Christ. This meditation is the preliminary contemplation, or “principle and foundation” of the Second Week. Notice that it has two parts, each with its set of points. The first is an imaginative consideration of a good earthly king who wishes to conquer the world for God, and how a subject might respond to his call to join him in this battle. In the second and more important part, the focus transfers to Christ himself. For a brief commentary on this meditation, download this YouTube video by Kevin O’Brien SJ, author of An Ignatian Adventure (Chicago: Loyola Press, 2010). The person is invited to contemplate the life and mission of Jesus Christ, precisely, in terms of the desired grace of this Week (made popular by the musical Godspell): “that I may know you more clearly, love you more dearly, follow you more nearly” (Sp.Ex 104). 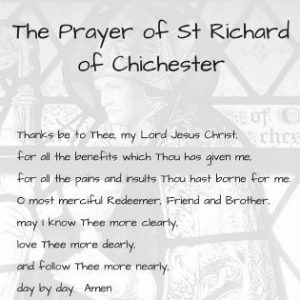 This prayer has been traced back to St Richard of Chichester (1197-1253AD). It is fascinating that Ignatius had access to this English prayer and incorporated it into the Spiritual Exercises. How one goes about these Gospel contemplations is explained carefully by Ignatius in SpExx 101-117, adapted by Fleming in his modernised version. The supplementary material of SpExx 261-288 provide suggested relevant Gospel texts. Essentially, we are invited to enter into a particular scene, place ourselves there, speak with the characters or simply contemplate them in silence, and generally become immersed in the scene as far as possible with our whole being. One of Ignatius’ helps to such immersion is the ‘application of the senses’ where one is invited to ‘see’, ‘hear’, ‘touch’, ‘taste’ and ‘smell’ the particular scene (cf SpExx 121-126). After the prayer period, during the 10 or so minutes of reflection (and possibly journal-writing), we reflect on what feelings were evoked during our time of contemplation. Was it a movement of consolation or desolation? In which direction is the Holy Spirit moving me? Clearly this kind of contemplation draws upon a person’s imagination as well as his/her engagement with the biblical text. Notice how the three persons of the Trinity, looking down upon the world and its great needs, decide to send the Son as Man to live among the people and show them who God is and how much God loves them and want to share God’s life with them. In this phrase, Ignatius is suggesting that as a way of placing ourselves in the Gospel scene, we use not only our imagination but our bodily senses as well. After preliminary settling down to pray and asking for a particular grace, we try to see the scene we are contemplating (with the eyes of our imagination), hear what the characters are saying, smell and taste the environment, and reverently touch any objects that seem sacred to us in the scene. Between the meditations of the Call of Christ the King and the Two Standards, we are invited to focus on the birth and early life of Jesus. Such contemplation provides a peaceful and gentle lead-in to the discernment of one’s particular vocation and the challenges of accepting such a call to discipleship. The first of this pair of meditations is referred to as the Two Standards. It might otherwise be called Two Ways or, in Fleming’s terms, Two Leaders, Two Strategies. At first the person who has experienced deep conversion of the first week moves into the second in the first flush of renewed commitment and enthusiasm. There is often something of a brief ‘honeymoon’ when prayer seems comparatively easy and nothing is beyond one’s strength. But it is not long before doubts and temptations arise. Anyone who begins to take seriously the call to discipleship will soon find themselves torn between a deep desire to give themselves entirely to God and, at the same time, an attraction to the ways of the world. It is this tension between the two ‘ways’, that of Christ on the one hand and Satan (‘the evil spirit’) on the other, which constitutes the meditation on ‘the two standards’. 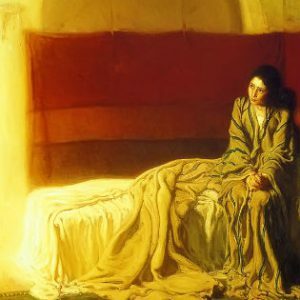 It is not hard to see why a most suitable related biblical text is the experience of Jesus’ being tempted in the desert (Matthew 4:1-11; Luke 4:1-13). This meditation is closely related to the two standards. Here we look at the situation not of the one who calls, but the person who is being called. How am I going to respond? Ignatius suggests that there are one of three ways. None of them is that of the person who simply rejects or ridicules the call. What is at stake is the level of enthusiasm and generosity of the respondent, the disciple in the making. Clearly, we all recognise the desirability of the ideal represented by the third type. But all sorts of un-freedoms get in the way. Ignatius suggests that through grace, we are drawn to move ever more closely to the ideal that is the work of the Exercises overall, and the Second Week in particular. From here on, the contemplations of the second week follow the public life of Jesus, his teaching, preaching and healing ministry with the people of 1st century Palestine. Ignatius provides ample suggestions for relevant Gospel passages; but any related readings, icons, music that help our prayer are to be encouraged. Ignatius stresses the fact that each person’s experience is different, even when seeing or hearing the exactly the same Gospel passage. As Ignatius would say, we should make full use of whatever brings us closer to God. This fourth meditation is a variant of the third. Since the goal of the Exercises is inner or spiritual freedom, and it is through truth that we reach such freedom (John 8:31), then whatever is most of truth is the shortest road. Ignatius sees truth as intrinsically linked to humility. It is not a kind of grovelling denial of what God has given us, much less of His work in and through us. But it is an honest and grateful recognition that all is grace, all is from and for God; to live with this kind of detachment from any self-seeking or self-interest is to be most authentically another Christ. The reason this meditation immediately precedes the last section of the second week is that, at this point, the retreatant is invited to discern his or her vocation in life or some other major decision. For those who are already committed to a state of life, it is the opportunity to renew such a commitment. Now the retreatant is ready to move into the deeper contemplation of the Passion and Death of Jesus.